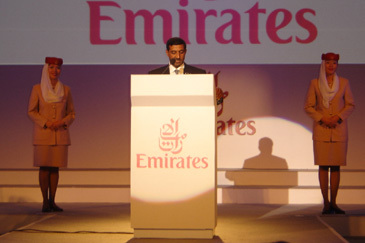 His Highness Sheikh Ahmed bin Saeed Al-Maktoum, Emirates Group Chairman is speaking at Gala Dinner at Millennium Seoul Hilton Hotel on May 26, 2005. 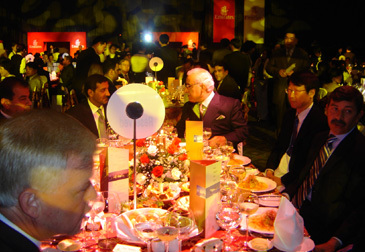 Emirates Group Chairman Sheikh Ahmed bin Saeed Al Maktoum hosted a gala function at Hotel Millennium Seoul Hilton on May 26, 2005 for local industry partners after attending the opening ceremony of Emirates new Korea office in Seoul earlier in the day. Sheikh Ahmed flew into Seoul this week to celebrate Emirates Airline's daily non-stop services between Seoul and Dubai launched on May 1 accompanied by a group of senior Emirates executives which include Ghaith Al Ghaith, Executive Vice President Commercial Operations Worldwide; and Richard Vaughan, Senior Vice President Commercial Operations Far East and Australasia. "Our new dedicated town office will help us provide our customers with top-value, quality service,"
said Sheikh Ahmed who is here for the first time. Emirates has recruited an experienced and enthusiastic Korean team to manage its sales, cargo and airport operations in Seoul, ensuring that customers enjoy the airline's award-winning service on the ground and in the air. Sang-Jin Lee, Emirates Area Manager Korea is expressing his deepest welcome to the guests. "This is a proud moment for our team, which has been working diligently to ensure a smooth start of Emirates' local operations. We will do our utmost to ensure our customers' needs are met efficiently, at the high service standards that Emirates is renowned for." 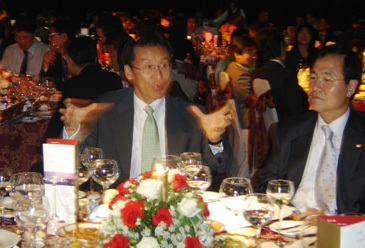 Sang-Jin Lee, Emirates Area Manager Korea said. Seoul is one of the newest destinations to join Emirates' fast-growing network which spans 78 cities in 54 countries. Emirates operates an Airbus 340-300 aircraft in three-class configuration on the Dubai-Seoul route offering a capacity of 267 passengers and 13 tonnes of bellyhold space for cargo. Customers flying on Emirates' Seoul-Dubai service can look forward to international gourmet cuisine with options tailored to Korean palates, a wide selection of the latest inflight movies including some of the most popular Korean shows, and top-class service from the airline's award-winning cabin crew, which includes over 220 Korean nationals. Flight EK323 takes off from Inchon at 00:30 hrs and arrives in Dubai at 05:25 hrs, providing excellent onward connections for Korean travelers to Emirates' destinations in Europe, Africa, the Middle East and New York City. Flight EK322 departs Dubai International Airport daily at 02:25 hrs arriving at Inchon International Airport the same day at 15:55 hrs. His Highness Sheikh Ahmed bin Saeed Al-Maktoum, Emirates Group Chairman cuts the ribbon to officially open the new Emirates office in Seoul. His Highness Sheikh Ahmed bin Saeed Al-Maktoum (3rd from left), Emirates Group Chairman is talking with Amb. Saleh M. Al-Rajhy (3rd from right) of Saudi Arabia. 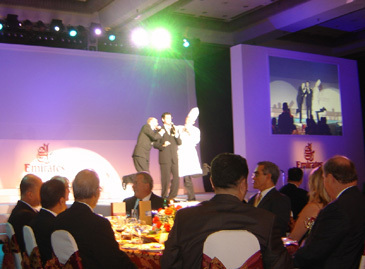 At right, Amb. MK. Helmy of Egypt. 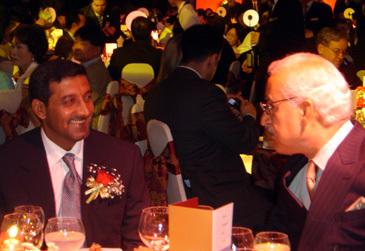 His Highness Sheikh Ahmed bin Saeed Al-Maktoum (left), Emirates Group Chairman is talking with Amb. Saleh M. Al-Rajhy of Saudi Arabia.